Domestic demand- Is it topping out? The 4 March elections resulted in a hung parliament, and the two-month long history of this new legislature has been marked by repeated unsuccessful attempts to break the political gridlock. Two rounds of consultations and two explorative mandates simply confirmed the staunch cross-vetoes which have prevented the formation of viable political alliances. The persistent gridlock persuaded President Sergio Mattarella to speed things up, putting political actors with their back to the wall. To this aim, he called a final one-day wrap-up consultation day, after which he would take the initiative. As no new unexplored solution emerged at the end of that day, Mattarella announced that he would soon launch a “neutral” government with a time-limit attached, bringing Italians back to the polls in early 2019 at the latest. Against this backdrop, Luigi Di Maio, the leader of the 5SM, and Matteo Salvini, the leader of the League, came up with a surprising last-minute attempt to strike a deal and form a government together. All this was made possible by the decision of Silvio Berlusconi, the leader of Forza Italia, to step aside and allow the League, its main coalition partner, to start coalition talks. The two parties together could count on a solid majority at the Chamber of Deputies (349 MPs with a majority threshold of 316) and a thinner one at the Senate (169 MPs against a threshold of 158). As we write, 5SM-League talks are ongoing. Building such an unprecedented alliance is not proving easy. Compromises must be made on a common programme and new prime minister- not an easy task for two parties that based their electoral campaigns on radical calls. The League had focused on the introduction of a flat tax system, the abolition of strict pension rules introduced by the Mario Monti government (the so-called Fornero reform) and on fighting illegal immigration while 5SM advocated for the introduction of a universal basic income. Both parties seem unwilling to backtrack on these calls, but will likely have to soften them to find a solution. On other issues, such as industrial policy, the reform of the public administration and the health service, programmes overlap enough to avoid serious tensions. The big question mark relates to where the balance would lie on crucial issues such as the relationship with Brussels and fiscal discipline. Reconciling Salvini’s consistently critical attitude towards Europe and the euro with the (untested) pro-euro conversion of Di Maio might prove difficult. We believe that President Mattarella, before giving the mandate, will be very clear in recalling the existence of domestic and external constraints imposed by international treaties. Within the current institutional framework, abandoning fiscal discipline would not be an option. In our view, a 5SM/League government would at first try to change European governance “from within” while maintaining a very vocal critical attitude towards the European establishment. The forthcoming European Council meeting, due in late June, will offer any new government a timely opportunity to show how disruptive it wants to be (if at all) with regards to current European rules. Should the ongoing 5SM/League attempt fail, Italy would be back to square one, with the prospect of a new “neutral” government named by Mattarella, which would bring the country back to the polls, more likely in the autumn. 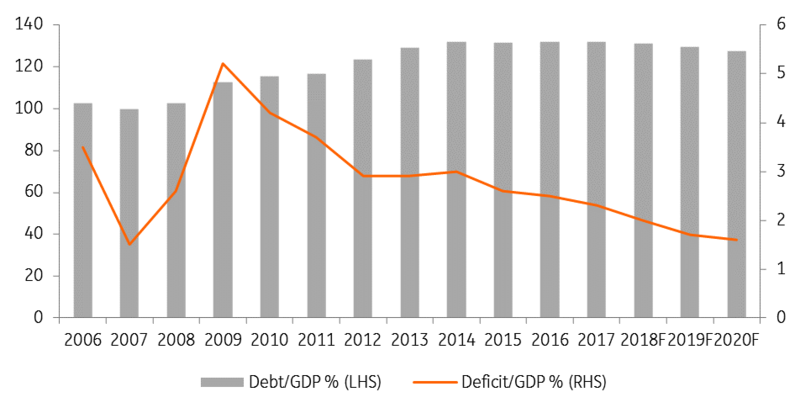 Would a 5SM/League government put fiscal consolidation at risk? The Italian post-election saga has unfolded at a time when the Italian economy has continued to expand at a moderate pace. In both 4Q17 and 1Q18, Italian GDP has grown 0.3% quarter on quarter, down from 0.4% in the two previous quarters. According to Istat, domestic demand, gross of inventories, was the main engine of quarterly growth in 1Q, while net exports were growth negative. While business confidence came in on the soft side, consumer confidence remained upbeat, helped by the return of employment to pre-crisis levels. The contraction of inactive workers resulted in a renewed expansion of the labour force in March, keeping the unemployment rate stable at 11%. Looking ahead, there are signs from early 2Q data that domestic demand may slow down. Both manufacturing and services confidence fell in April, mainly due to softer orders. 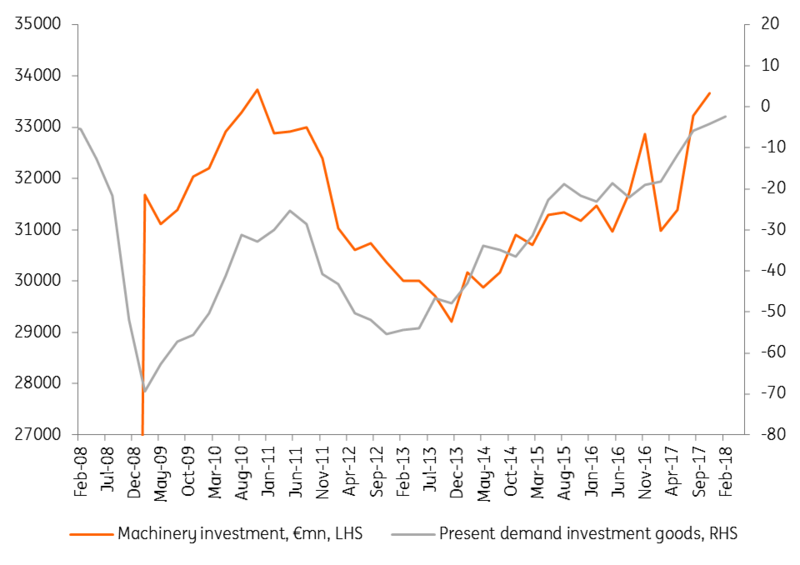 The deterioration in the manufacturing investment goods sub-index, a rock solid confidence driver over 1Q18, rang an alarm bell, possibly reflecting increasing unease about the political gridlock, in spite of existing tax incentives. Still, confidence in construction posted a comforting gain, suggesting that the sector is finally bottoming out. Consumer confidence, only marginally down, was close to recent highs. The positive mix of employment gains, bottoming out wage growth and low inflation is apparently helping households. Would the installation of an unprecedented 5SM-League government have a substantial short-term impact on the Italian economy? If extreme calls are avoided, we believe the answer is no. Still, we see private investment as relatively vulnerable. Should the idea of a radical re-tuning of the tax system be pushed through, the related uncertainty about the sustainability of promised tax cuts might make businesses more prudent. With calls for a mini-budget already echoing from Brussels, and with the need to sterilise a VAT increase worth €12.4bn which has been budgeted for 2019, any ambitious spending plan would very soon meet the test of the relevant funding. President Mattarella will have some preventive work to do.